I know The Geez loves lacrosse, so when I was on campus recently and saw a bunch of guys playing the game, I found it was a game I had no understanding of. But after about an hour I really got into the game that has both speed and finesse, and a few collisions too; which I like. After talking to some of the players I found our Pilots Lacrosse Team travels around the west and competes in a league. Who knew?? 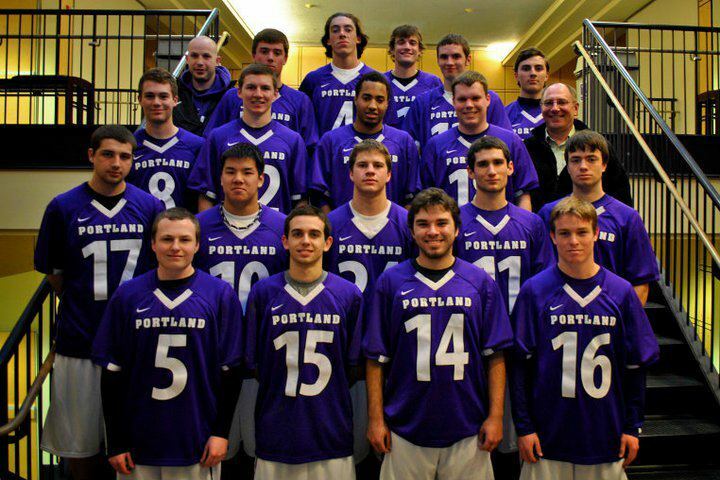 The University of Portland Men's Lacrosse club competes in the MCLA and is a member of the PNCLL Division II South Conference. As a fourth year program, we are looking to build on the previous season. Our roster is comprised primarily of freshman and sophomores; currently we have over 20 student athletes on our roster. Our home field for practices and games is Prusynski Field, a new turf field facility complete with practice lighting, backup netting, and lacrosse specific lines. We view ourselves as a virtual varsity program, striving to compete at a high level. It's a sport God invented just for me. The coach hands you a stick, then tells you "go out and hit somebody". Just so you know... My affection for Lacrosse comes legitimately. I was a founding member of my college Alma Mater's lacrosse team, and was an assistant coach there after I graduated back in the stone age. The current coach is the winningest coach in ncaa Lacrosse history. The men's team is currently ranked #1 in the nation in D3 and is currently unbeaten. The women's team won the National championship last year in D3 and is currently ranked #1 this year, is undefeated, and just garnered 19 out of 20 first place votes in the coach's poll. I'll be back East this spring to watch them both make another run at it all.